Comox Valley real estate encompasses a wide coastal area of Vancouver Island that includes, the Town of Comox, Comox Peninsula, Courtenay, Crown Isle, Cumberland, Merville/Black Creek, Union Bay, Fanny Bay, and Royston. With its moderate climate, picturesque setting and abundance of outdoor activities, buying a house in Comox Valley means more than just getting a home with a view, you're buying a lifestyle. Check out the homes for sale in these exceptional communities, or read more about Comox Valley and the wealth of amenities this area has to offer. Comox Valley - "Land of Plenty"
The First Nations called the Comox Valley area "Komoux", or "Land of Plenty" because it was so rich in fishing and marine life, deer, farming and logging. It's not hard to see why the early European settlers decided on Comox Valley to build their first homes. Today, all those same resources are enjoyed by local residents and seasonal tourists. Nothing beats the Comox Valley area for its sheer beauty. 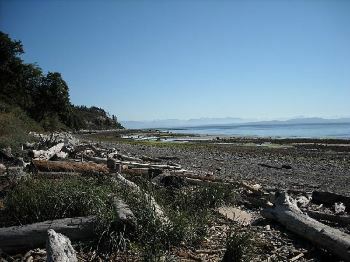 Most people love to spend time outdoors, enjoying the scenery and living the Comox Valley lifestyle. Whether you're spending an afternoon exploring estate wineries, local farmer's markets and specialty shops, or hiking through an alpine meadow, you'll find an abundance of recreational activities at your doorstep.